In January 2019, Knox+Watanabe went on a research trip to the world’s northernmost settlement, Longyearbyen (population ~2000). 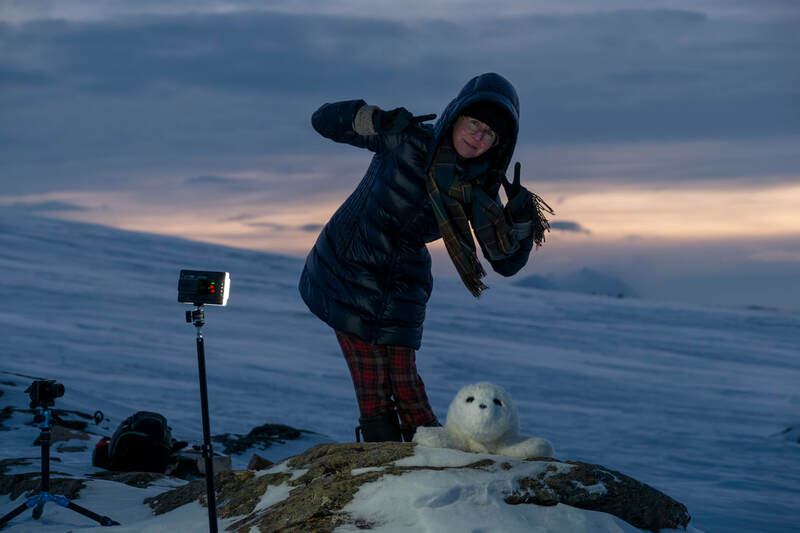 Here, at 78° latitude and just 1200km from the north pole, we created Protective Seal, an artwork series with Japanese therapy robot PARO, which is modelled after a harp seal. 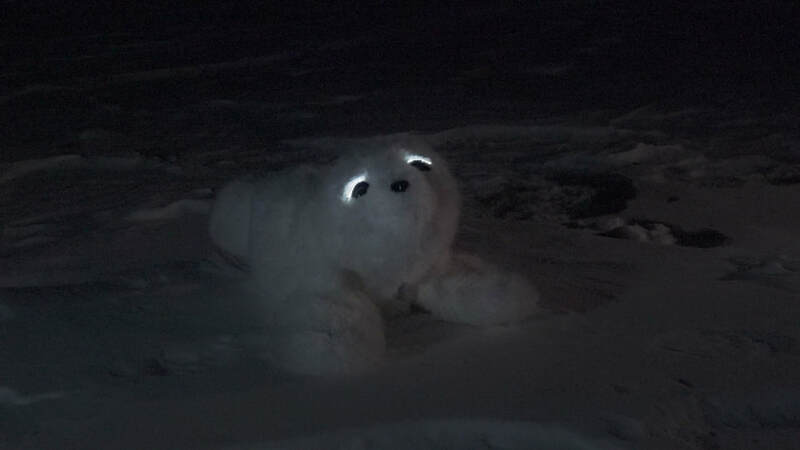 PARO enters this world of ice and darkness — true harp seal habitat — and interacts with life- and land-forms there. It is a pilgrimage home, of sorts. It is an enormous, poignant adventure for a robot that has never even been outdoors. The Arctic is a crucial zone for futurists. It is the crux of our environmental crisis: ice-melts, the ozone hole, permafrost thaw, and atmospheric carbon release. It is a cradle of chronic, proliferating repercussions. Fusing science, story-telling, contact with locals and surreal, apocalyptic visions, Protective Seal finds a human–environment–machine link, and a medium for the theorization of sentient phenomena, in the AI sensory robot PARO. Protective Seal is assisted by the Japan Science and Technology Agency (JST) through a CREST grant, and is part of the Implicit Information Project at Watanabe Lab. 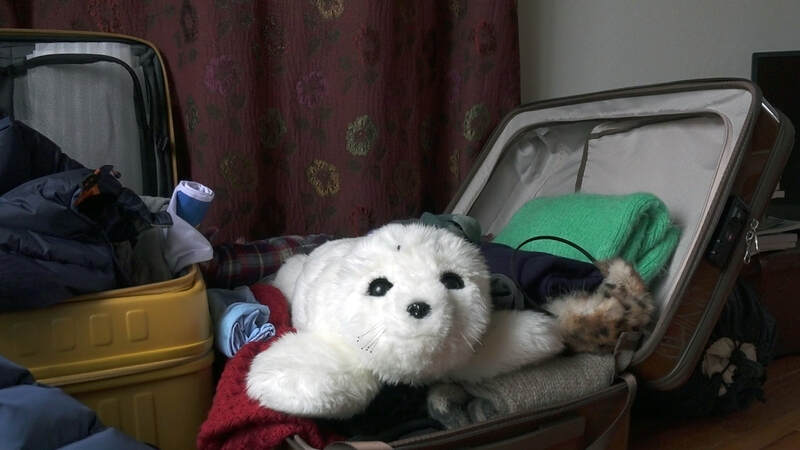 PARO is a companion robot; and a ‘mental commitment robot’. It was named World’s Most Therapeutic Robot by Guinness World Records in 2002.
investigate machine subjectivity — as AI develops, what is reality for a technology? what is self? what is being-with-others? Borderline cases in the definition of life illuminate new ways of understanding phenomenological and techno-industrial change. Generally accepted requisites for life (e.g. energy transformation, reproduction, response to stimuli, continual change preceding death) can hypothetically extend to fire, weather, pollution, and software programs. ​Life’s definition is not just scientific but cultural, occupying the grey and fuzzy penumbra. Many Eastern philosophies recognize non-humans as sentient beings. Often, this approach signals care and respect for objects and environs. PARO is fuzzy, it is a machine, it is a friend, it is changing and learning and responding to stimuli, and we collaborate with it to unravel the questions: Who and what is sentient? How should we ethically regard and esteem this quality? Protective Seal dramatizes data on changing atmospheric conditions, correlating this data to sensations expressed implicitly by humans when interacting with PARO (as part of our Implicit Processes Project). The Earth’s environment could also be said to be expressing implicit responses to sensory stimuli, which we provoke and read via technological and narrative-historical means. PARO is a technology developed for palliative function: it helps people with the quality of their last times on Earth, by providing the impression of something sentient to care for. Imaginatively adopting PARO’s point-of-view, we engage with humans and natural phenomena in the Arctic using bio-sensing technology. We observe PARO’s effect on human subjects and also their perception of the robot’s relative ‘sentience’. 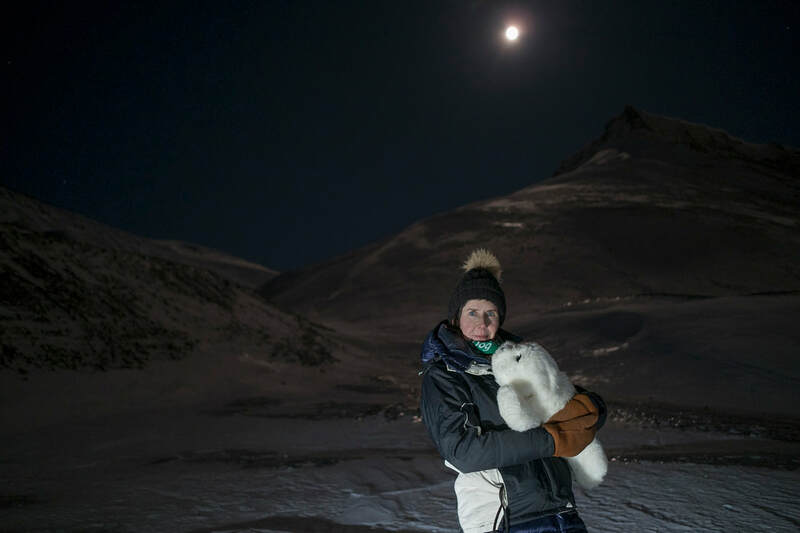 We imagine that PARO has subjective phenomenological experience (qualia), and we extend this poetic assumption to the harp seal’s environs, Svalbard, and thus to the whole Earth. The creative inquiry of the project seeks an enlightening sentience in the Arctic. PARO’s great professional success has been with people with dementia. Correspondingly, we humans have a certain dementia about climate change: we resist acknowledging its onset; we cannot remember the various scares and facts long enough to sustain action; we don’t learn from history but repeat ourselves. One could also say that the climate itself is becoming demented*. To encourage climate action, perhaps art-based anthropomorphism can reach us where bald facts, logic and appeals to physics, chemistry, biology etc. cannot. PARO’s capacity as medium or go-between helps us to assess/address the humanized environment’s qualia, emotions, and entropic trauma. 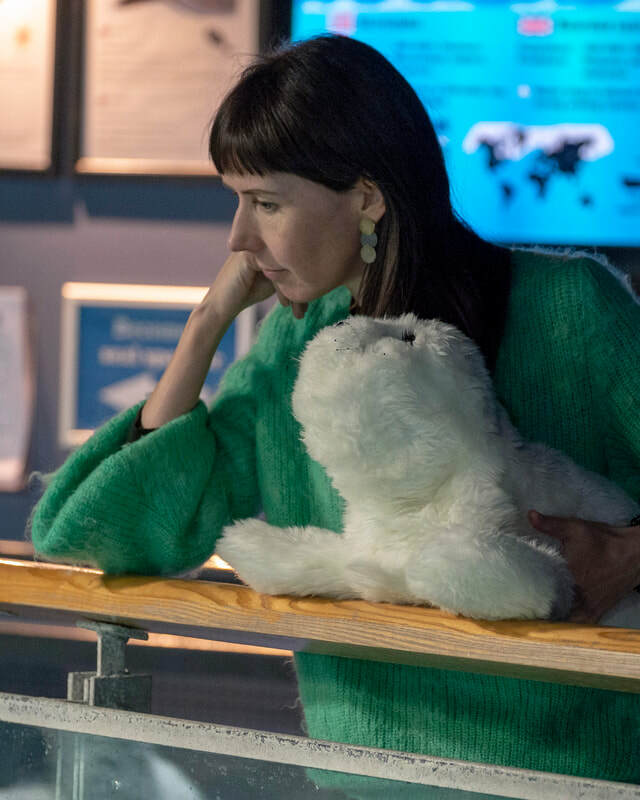 PARO goes to the sunless north pole on a mission to give a planet that has turned from nature to technology-worship something to care for that it still understands. Perhaps, PARO may serve to trigger the demented ecology to remember things it once knew. Protective Seal draws from the special research facilities on Spitsbergen, such as satellite station SvalSat, Norwegian Polar Institute’s Zeppelin Observatory, and The University Centre Svalbard. Particularly, we integrate webcam footage of atmospheric monitoring by the Zeppelin Observatory, located in the remote outpost of Ny-Ålesund. Similarly, we unobtrusively measure atmospheric conditions in the body/mind, using E4 bio-sensors to observe heart rhythm patterns, neural responses and temperature fluctuations. Locals, wearing E4-sensors, tell PARO stories about their land. The E4 is a wearable research device allowing real-time physiological data acquisition. Using custom software for analysis and visualization, we measure physiological and neural responses to PARO, and to thoughts of rapid climate change. We also measure PARO’s possible effect on such (at this stage, presumed) anxiety. In this way we create an art series on sensing emotion in landscape, and human connection to landscape, via the robot mediator PARO. We work towards our goal of integrating insights from both micro and macro types of human–machine companionship for creatures’ and ecologies’ health. Other methods of gathering data include video, photography, infra-red filtering, transposition of biodata into sound, transposition of sound recordings into biodata. ​On the way home to Tokyo, PARO attended seal training with live seals at Polaria in Tromso. * In 2011, 200+ seals were stranded along the Arctic coast in a mass ‘mortality event’, their symptoms consistent with radiation burns. Using blacklight tools and UV radiation sensors, PARO retells this true story to humans.